No matter which airport you are flying from or flying to in the world, they generally have an airport bus service in operation to transfer passengers to and from the airport. Most airports and local bus companies usually work together to ensure that there are regular airport bus services running throughout the day to and from the airport. The airport bus services are usually the cheapest form of transfer for passengers getting to and from the airport and if you are travelling on a limited budget or alone, it is one form of transfer you should consider. Most airport bus service are scheduled to coincide with the flight arrivals and departures of the airport. This then means that there is normally a service available that will get you to the airport in good time prior to your departure time and also there will be an airport bus service waiting at the airport upon your arrival to take you to your chosen destination. Most airports will have a local public bus service in operation at the airport. These services are usually operated and managed by a local bus company and run at regular intervals throughout the day. Depending on which airport you are arriving at or departing from will obviously determine which type of airport bus services are available and how regular they operate. There are many different types of airport bus services in operation at all the airports around the world and they can vary depending on the size of the airport and how busy the airport is. If the airport is a major International airport such as Heathrow Airport or LAX airport in Los Angeles, you will find that there are a larger choice of airport bus services that if you were to fly into a smaller airport such as Reus Airport in Spain. The major airports such as Heathrow Airport have flights arriving and departing literally every few minutes and as a result, have a large number of passengers arriving on flights at the airport requiring transport for transfers to their final destinations, hotels, car parking or even to different terminals if they have connecting flights. There are also a large number of passengers departing from the airport on flights and this means a large number of passengers requiring transport to the airport from a number of different locations. This then means that the bus services to and from the airport need to be very frequent to handle the large number of passengers getting to and from the airport. The airport bus services that run to and from the major airports usually every few minutes throughout the day. Car parking airport bus services and airport bus services that are operated by major coach companies such as National Express, Terravision, Greyhound and many more. However, the many smaller airports such as Reus Airport in Spain have a less frequent number of flight arrivals and departures and as a result, do not need as many airport bus services in operation. Most of the bus services in these smaller airports are designed to coincide with the flight arrivals and departures of certain flights and are therefore scheduled at much more specific times rather than every 10 minutes throughout the day. All airport bus services are different and the price will vary depending on the airport, destination and distance of the journey. The majority of airport bus services will have a set fee from the airport to specific destinations and the tickets can either be purchased by pre-booking in advance, at the airport or on the bus from the driver. 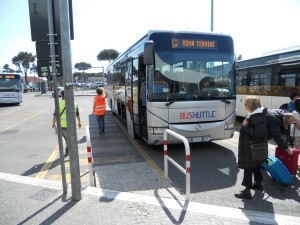 generally, the local buses from the airport will allow you to purchase your ticket on the bus but if you are not sure, it is always best to ask at the information desk upon arrival at the airport. If you need to purchase your ticket in advance at the airport before you board te bus, then a member of staff at the information desk will inform as to where you can purchase your ticket. Sometimes you will be able to purchase them from the information desk and sometimes there will be a designated kiosk to purchase your tickets from. Some airports have machines where you will need to purchase your ticket but if you have any doubts, ask at the Information desk. Most major coach companies such as National Express and Terravision who provide airport bus transfers allow you to book online and if you have this option, it is always recommended. Booking your seat in advance ensure you have a seat and provides you with peace of mind. As we mentioned previously, most airports have a local bus service that operates to and from the airport. Obviously we cannot list all the local bus services for each individual airport throughout the world on this website. If you want to find out the times of the local airport buses from a specific airport, then the best way is to simply visit the airports own website. Most airports websites list the times of the local bus services that run to and from the airport. However, if you are wanting to find alternative airport bus services that provide connections to the neighbouring towns, resorts and major cities close to the airport, then using one of the reputable airport shuttle bus services is advisable. There are a large number of companies that provide bus services to and from the airport around the world and they provide a cheap and efficient form of transport to and from the airport. There are several different types of airport shuttle bus services that are available and you can choose from, shared bus services, private mini bus services and coach transfers. Shared Airport Bus Services: If you do not want to wait for the local bus service, you can pre-book your transfer on one of the shared airport shuttle bus services. These are usually smaller mini buses that operate a door to door service to your hotel. Private mini Bus Services: If there are a larger number of people travelling in your group, it can sometimes work out a cheaper option to pre-book a private mini bus. Coach Transfers: Many coach companies now offer airport bus services that run from the airport to a large number of destinations. They also have services that run from major cities and towns to the airport. Many of these coach operators provide services that coincide with the flight arrivals and departures (especially ones from the smaller airports that the low cost airlines fly into). There are several companies that provide airport bus services in the UK that connect passengers to and from the airport through the UK. One of the largest operators that provides airport bus transfers is National Express.